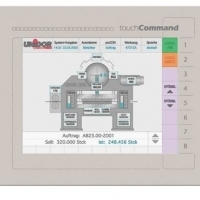 Unidor press controls are general purpose units that measures, controls, checks, compares and evaluates the analog and digital signals of sensors, encoder and transmitters.The user-friendly control with the Touch-Screen is so easy to manage and uncomplicated. Using images instead of buttons, the system guides, informs and helps the operator through every process. Press tonnage and tool protection system from Unidor – the Unidor multiCONTROL.